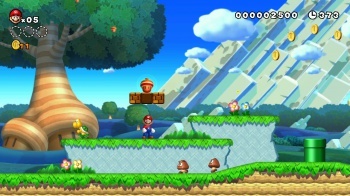 With the Wii U launch fast approaching, Nintendo deletes an important bullet point for its flagship platformer. After previously pushing 1080p high-definition support for the upcoming New Super Mario Bros. title on Wii U, Nintendo has quietly removed this claim from the game's official website. In a section which previously read "Experience Mario like never before... in full 1080p HD," the mention of 1080p has been deleted and replaced with the much less specific "high definition." With the original Wii only capable of 480p resolution, the Wii U's ability to fully take advantage of today's most popular high definition standards should be a pretty big deal for consumers. But just because a system is capable of 1080p doesn't mean its hardware can handle running any given title at that high of a resolution. Being a first party Nintendo title for an all-new Nintendo system, fans would likely hope that the company can start things off on the right foot with a title that really shows what the console can do. Nintendo hasn't publicly addressed the change, but it seems somewhat nonsensical to remove an important bullet point unless it is untrue or misleading. New Super Mario Bros. U is scheduled to launch alongside the Wii U console on November 18th, meaning we're quickly closing in on crunch time for the title. Is it possible that the game will indeed support 1080p? Sure. Would we bet on it? Given the last-minute wording tweak from Nintendo itself, probably not.